Today, Smart Growth America announced the selection of six communities that will receive technical assistance in using small-scale manufacturing as a strategy to create economic opportunity, boost the prospects of Main Street, and build great places. This assistance is in partnership with Recast City and is made possible through funding from the U.S. Economic Development Administration (EDA). Technological and economic changes have led to a surge in small-scale manufacturing and the growth of the “maker economy.” This new sector—which includes everything from microbrewers to prosthetics manufacturers to yarn makers—can help residents access high paying jobs and economic opportunity in the neighborhoods they call home. In 2016, Smart Growth America, with EDA support, worked with four communities—Knoxville, TN, Lowell, MA, Youngstown, OH, and Twin Falls, ID—as they sought to intentionally build their maker economies. Encouraging more small-scale manufacturing on main street or in other close-in, walkable neighborhoods can foster entrepreneurs and homegrown industries. These businesses bring vitality to main streets and neighborhood centers, creating a foothold for future growth. “At a time when local economic development has become heavily dependent upon place-making, small-scale manufacturing has emerged as a way to tie opportunity to place. For many communities, especially those with legacy buildings from an earlier manufacturing age, it can fill a key missing piece for local economic revitalization,” said Christopher Zimmerman, Vice President for Economic Development at Smart Growth America. “Every person deserves to live in a place that is loved—its businesses thriving, its real estate valued, and its people proud. These projects are an exciting opportunity for the selected communities to put small-scale manufacturing front and center to achieve these outcomes,” said Ilana Preuss, Founder & CEO, Recast City. Sixty-four organizations and communities in 32 different states with diverse economic and demographic backgrounds applied for this year’s technical assistance. The applicants included municipal governments, local non-profits, and regional- and state-level organizations. While the communities showed various levels of existing engagement with their small-scale manufacturing communities, all had a strong understanding of its potential for economic development and downtown revitalization. Many communities have previously relied on attracting large-scale manufacturers to sustain their communities and realize now is the time for change. Communities around the country, including these six, are pivoting to capitalize on the importance of place, reposition and diversify their economies, and recognize their talent base and existing workforce clusters. 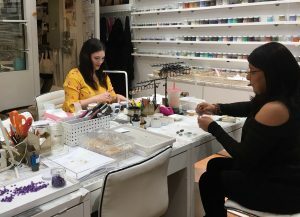 Baltimore, MD: Baltimore is experiencing a surge in owner-operated manufacturing businesses with lofty ambitions to resurrect the city’s rich manufacturing history. A handful of successful “makers” and the “Made in Baltimore” initiative suggest a promising future for place-based, local manufacturing. In order to provide job opportunities for low-income residents, Baltimore plans to use this opportunity to help three communities build strategies for preserving affordable production space amid rising residential and commercial demand. High Point, NC: High Point, the “Home Furnishings Capital of the World” has had a high amount of vacant or underutilized commercial and industrial properties in what is known as the “core city”—due to the relocation of many manufacturers over the past 25 years. High Point wants to reverse that trend by focusing on equitable redevelopment in an inner neighborhood. The city has identified the southwest quadrant with underutilized industrial sites and residents that lack economic mobility and job access as a place to start in the core city area. High Point plans to use this technical assistance to develop an action plan for workforce training and small business development in order to promote equitable outcomes for residents in this community. Lafayette, LA: The McComb-Veazey neighborhood has endured a flood of fleeing residents and now has a glut of empty, dilapidated buildings. A local non-profit hopes to stimulate more interest and investment in the neighborhood by leveraging this assistance with a recent lean urbanism grant and the city’s new Unified Development Code that promotes mixed-use, pedestrian-friendly development. The neighborhood is focused on supporting home-based food businesses and other artisan makers with the resources and space needed for success. South Bend, IN: South Bend has high potential to succeed in the maker economy with its co-working spaces, new mixed-use zoning, and strong business relationships. The city’s Smart Streets initiative and nationally-renowned Complete Streets policy are helping transform prime corridors into small-scale manufacturing hubs through place-based economic development. South Bend plans to use this opportunity to make policy changes, develop financing mechanisms, and build other tools to support small business and improve the quality of life, particularly for South Bend’s low-income communities. 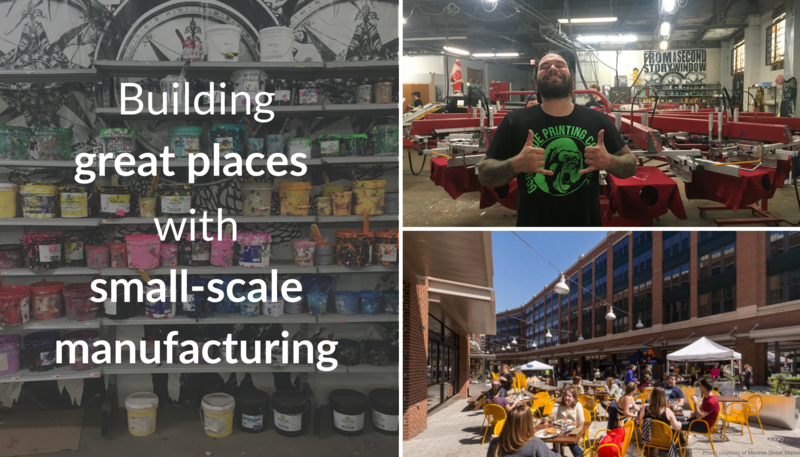 Columbia, MO: The Business Loop Community Improvement District in Columbia is looking to revitalize this working class neighborhood with new, locally-owned manufacturers. Although a clear artisan movement with an active start-up culture has emerged in recent years, the city lacks a comprehensive policy to develop and encourage small-scale manufacturing. Columbia plans to use this opportunity to implement workforce training, develop public financing mechanisms, and educate the real estate community about the potential of small-scale manufacturing. Cusick, WA: The Kalispel Tribe of Indians of northeastern Washington is working with municipal partners in this rural community to reinvigorate a local main street through small-scale manufacturing. The tribe is working to adopt a new regional plan that will allow for certain types of light industrial development by-right, instead of requiring a conditional use permitting process. The tribe plans to use this opportunity to refine the regional plan to better support light manufacturing and place-based economic development and to work with stakeholders to identify shared goals and develop an action plan to meet those goals. 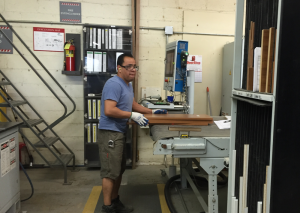 SGA’s final report, Made in Place: Small-Scale Manufacturing and Neighborhood Revitalization, offers detailed insight on our technical assistance engagements in 2016. SGA also offers technical assistance on a wide variety of issues on a pay-for-service basis. You can find additional resources on small-scale manufacturing in Recast City’s newsletter, Urban Manufacturing Alliance’s non-profit development toolkit, Etsy’s Craft Entrepreneurship program, and the Equitable Innovation Economies report from the Pratt Center for Community Development.